It’s a technique that is far from isolated to J.C. Penney. Yet somehow the department store has taken the fall for the widespread practice. This year the company has been struggling with a class-action lawsuit for its use of price anchoring to deceptively inflate prices. The practice involves showing a false “original price” on an item’s price tag, then posting a sales price below it to make it seem as though the customer is getting a deal. J.C. Penney’s CEO actually admitted to the practice in 2012 when he announced the company was switching to a transparent pricing policy. Unfortunately, that idea didn’t work out for the retail chain, so it resumed its original policy, leading to a lawsuit from customers who caught on to the tactic. The lead plaintiff in the J.C. Penney lawsuit claims that she purchased three blouses at a sales price, only to notice the $30 original price listed on the price tag hadn’t been charged during the three months prior to her purchase. The shopper herself was the researcher in this case, using the information readily available to her to see for herself whether she was getting a deal. The J.C. Penney lawsuit only highlights a problem today’s retailers are facing. Price tracking software has made it easy for customers to closely watch the pricing habits of various merchants and hold them accountable for discrepancies. When a business claims a product has dropped dramatically in price, savvy consumers who use price monitoring tools will know instantly that it hasn’t, since they have a multi-month snapshot of a product’s pricing history. Today’s customers want a deal. As a result, competition has forced businesses to resort to drastic measures to lure customers in. By offering a special discount, a retailer can offer its customers a feeling of exclusivity, luring them in when competitive price monitoring has made it easy to be undercut. But as important as it is to monitor competitor prices and offer the best deal in town, retailers have to be smart about it. They must find a way to offer this exclusivity without sacrificing their integrity and risking reputation damage if they’re caught. 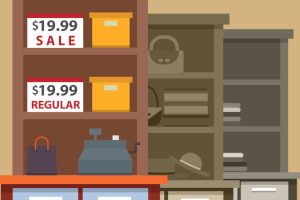 Even taking ten percent off an item for a special sale is better than falsely marking it up to make it seem as though the customer is getting a good deal. Thanks to the use of price monitoring tools like PriceManager, customers have become savvier than ever. This means that businesses must be up front and honest with customers. Instead of offering shady sales and false price markups to lure customers in, businesses should monitor competitor prices and be competitive to win customers over without being dishonest.